You wouldn't be off-base to assume this is a comic adaption of the new Punisher movie that just came out last week but in fact it's a new weekly mini-series from Garth Ennis and Steve Dillon that I'm not sure has anything to do with the movie but is instead a sequel to their "Welcome Back, Frank" story arc from the Marvel Knights Punisher comic from a few years ago. 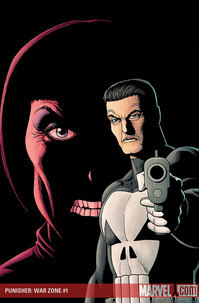 If you're more familiar with Ennis' recent run on the Marvel Max version of the Punisher, the Knights version was what is referred to as the "funny" version of the character at least by comparison. If you've read Preacher by the same guys than you know what their idea of "funny" is. ...what were we talking about again? Oh yeah, old newspaper strips. Though the character got it's start in a pulp novella, this comic strip is where he really took off into the public consciousness. From an artistic perspective, we're not talking Alex Raymond or Milton Caniff levels of greatness here, but from a historical perspective this is an important one, worthy of the $40 hardcover treatment. Without Buck Rogers we wouldn't have Star Wars, Duck Dodgers in the 24-1/2th Century, and our fond memories of Erin Gray. 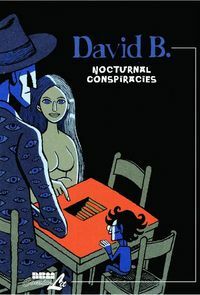 David B. has a bizarre dreamlike style that lends itself perfectly to a book in which he describes nineteen dreams that he's had between the period of 1979 and 1994. If you've read his highly acclaimed book, Epileptic, or any of his recent work in the anthology, MOME, you know that his graphic, black and white line work is all about imagination and psychological expression and not so much about reality. That said, the art in the previews for this one look a little more reined in than some of the wacked out stuff he's capable of. Oh and look there's a color in there. 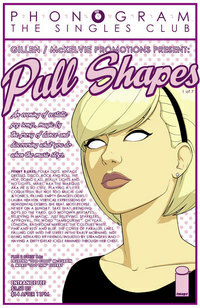 The first Phonogram mini-series was a popular book that presented a world in which 90s British pop music had magical powers. It made stars of its creators, Kieron Gillen and Jamie McKelvie - the latter has recently been seen doing some Marvel work. This new mini-series is a collection of single stories that each take place on the same night in the same nightclub. All revolve around music and magic and if you passed on the first series because it was in black and white you'll be pleased that, like McKelvie's beautifully pop-colored Suburban Glamour, this one is in full color. There's also a couple of backup stories with guest artists Marc Ellerby and Lauren McCubbin. I believe it was the esteemed Dr. Manhattan that once said "Nothing ever ends." If you went into last week's final issue of Marvel's latest mini-series event, Secret Invasion, expecting an actual ending to what you couldn't be faulted for thinking was a "story" you were mistaken. Again. These things don't end, they just lead you right into the next event. The good news is that the creative team is Brian Michael Bendis and Alex Maleev, frequent collaborators from such books as Daredevil, Illuminati and the occasional outstanding issue of New Avengers. Their run on Daredevil alone has filled me with enough good will that I'll give them the benefit of the doubt on any cash grab event they want to pull. Oh and I guess I'll go ahead and admit that the premise here sounds pretty good too. A "dark" version of the Illuminati. A group of villains that have been pulling strings in the same way that the "good" version of the Illuminati has been doing. 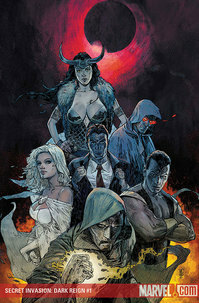 And the funny thing is that Namor appears to be a member of both groups. The second volume of Jeffrey Brown's new anthology where he branches out into new genres like mixed martial arts fiction. I hear this one has an 80 page fight sequence. DC brings back the Milestone characters so that the JLA can beat them up, apparently. A graphic novel by Quebecois cartoonist Pascal Girard that deals with the true story of the death of his younger brother but in a direct, honest way that at times is actually funny. Marvel's latest release from their Soleil line of European reprints. This one is a classic series about the three survivors of a spaceship crash on a strange planet being pursued by deadly mercenaries. 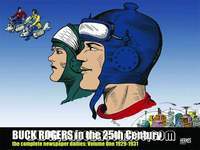 If you'd prefer, save your money on the Buck Rogers reprints and pick up the second reprint volume of this classic strip instead. A Marvel adaptation of the classic novel by Eric (Age of Bronze) Shanower and Skottie (New X-men) Young. Wasn't there a rumor a while ago about Static ending up in the Teen Titans? said Your Mom's New Boyfriend on December 10, 2008 1:06 PM. I think I heard that too. I'm not too up on the Milestone characters but I guess this might be a first step towards integrating them and the next step might be in Teen Titans. said Evil Richard on December 10, 2008 2:00 PM.